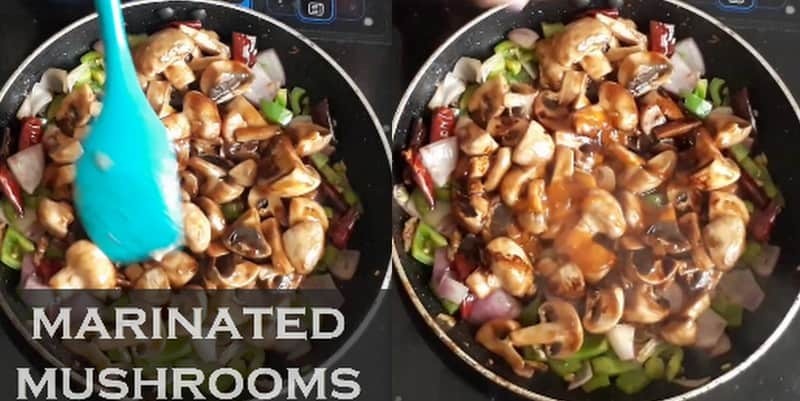 Kung Pao Mushroom recipe, Kung Po (Kung pao sauce) with detailed photos and video. Stir-fried mushrooms in Spicy Kung pao sauce. Peanuts, Dry red chili are the main ingredients. Kung pao recipes have been requested in my blog for quite a long time, especially kung pao Paneer. A few days back I decided to make a Chinese dinner, so when I was looking for some side dish which goes well for Veg noodles. I came across this Kuan Pao Mushroom and I had a packet of fresh mushrooms so I made it. 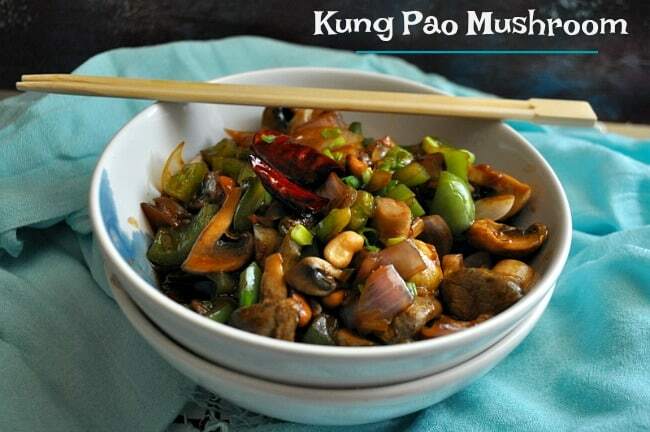 Kung pao can also be pronounced as kung po and it is very famous in Chinese cuisine. Kung pao chicken is a very famous restaurant menu and this kung pao mushroom is the variation of Kung pao chicken. Clean the mushroom and cut into medium sliced pieces. Take a mixing bowl add mushroom, light soy sauce, tomato ketchup, salt, and cornstarch. Mix marinate the mushrooms in Kung poa sauce for 15 mins. Heat oil in a pan, add the peanuts fry well, till it turns golden. Add the dry red chili, chopped ginger, and garlic saute well. Add the diced onions, bell peppers saute well. Add the marinated mushrooms and saute well. Add the dark soy sauce, chili sauce and saute well. Adjust the salt if needed. Finally, add the spring onions and garnish it. if you want it to be gravy add little water and make it gravy. Clean the mushroom and cut into medium sliced pieces. Take a mixing bowl add mushroom, light soy sauce, tomato ketchup, salt, and cornstarch. Mix marinate the mushrooms in Kung poa sauce for 15 mins. 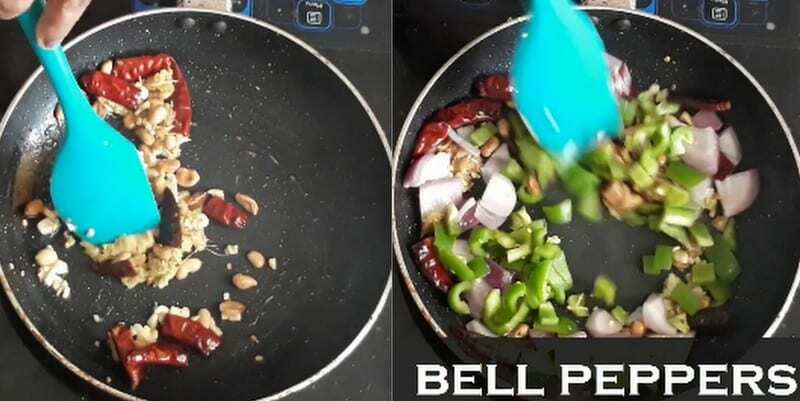 Heat oil in a pan, add the peanuts fry well, till it turns golden. Add the dry red chili, chopped ginger, and garlic saute well. Add the diced onions, bell peppers saute well. Add the marinated mushrooms and saute well. Add the dark soy sauce, chili sauce and saute well. Adjust the salt if needed. Finally, add the spring onions and garnish it. Adjust the salt as we have already added the salt for marination so compensate it while making. instead mushroom we can add paneer.